The specifications of this single board computer is impressive. I plan to use this SBC to run one of the Softrock Ensemble SDR tuners using the ghpsdr3-alex software. I discuss how to install the OS and the SDR server software on other pages. When I received my pcDuino3, LUbuntu was already factory installed in the NAND storage. My pcDuino3 also has the 4GB of NAND storage. My thinking is that this is more than enough memory to run the Softrock server software and the ghpsdr3-alex software. From time to time, the pcDuino team will release new kernel and Ubuntu rootfs images that contain new features or bugfixes, and it is a good practice to keep your pcDuino up to date. However, please ensure that all important data on your current nand storage has been backed up elsewhere, since the update will overwrite the NAND storage. This is very important, like in my case if I use the NAND storage to run the Softrock server and ghpSDR3-alex software. If I update the kernal and OS, I will have to reinstall all that software. Makes me think that I should probably use the MicroSD card I just bought to run the OS and the Softrock software instead! You can find the latest kernel and rootfs images for pcDuino3 on: http://www.pcduino.com/images-pcduino3/. I am going to bring my pcDuino3 up to date as part of my learning here. Updating is a two-stage process – first you update the kernel, and then the Ubuntu rootfs. We will use a Windows application called PhoenixCard to update the kernel, followed by plugging in a USB thumbdrive (or an SD card) containing the Ubuntu rootfs image and a shell script with special instructions. I am going to repeat the instructions here that are found here. 3. Two microUSB cables – one for connecting the pcDuino3 to the power supply, and the other for connecting the pcDuino3 to the Windows machine ( via the microUSB OTG port, located at the opposite side from the microUSB power port ). WARNING: Make sure you have all of your data backed up and kept elsewhere. This will remove all of your data. Current settings will also be reset to defaults. 1. Download and install PhoenixSuit v1.0.6 on a Microsoft Windows Vista / Win7 machine (it MUST be v1.0.6, please do not accept invitation to upgrade). 4. Copy these two files to the USB thumbdrive (or SD card) main folder ( not in any subfolders ). NOTE: If the Ubuntu rootfs download link gives you a file with an earlier date (e.g. …20140430.7z), its OK, it simply means that there has not been any changes to the rootfs since the one released that date, what you are downloading is the latest version. 6. Connect the powered pcDuino3 to the Windows machine using a microUSB cable. Plug the cable into the microUSB OTG port located on the opposite end of the board, beside the USB2.0 port. If Windows asked you to install drivers, just accept and install them. 7. Run PhoenixSuit. Check that pcDuino3 is powered and is still connected to Windows machine via microUSB cable. PhoenixSuit will show “No Device Connected” or "No Device Attached Yet". don’t worry about the inaccurate message, as long as your pcDuino3 is powered and is connected to the Windows machine it will be OK.
8. Click “Firmware” (top center), point PhoenixSuit to the downloaded kernel image file and click “Upgrade”. PhoenixSuit will say “No Device Connected”, and show a popup with 6 items in it. Again ignore the inaccurate messages and just follow the steps below. 9. Now press and hold the “upgrade” button on the pcDuino3 board ( beside the short Arduino header, at the edge of the board ). 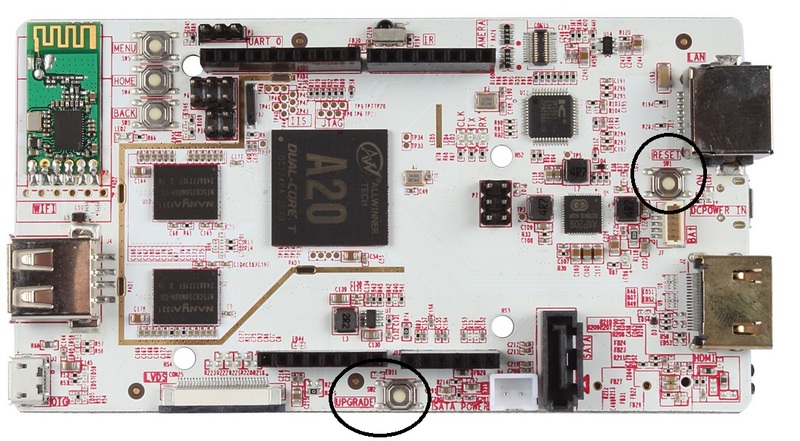 Keep holding that button and press the “reset” button ( beside the black SATA connector and the powerLED, OR, between HDMI port and Ethernet port for earlier version of the board ). PhoenixCard will ask if we would like to perform force-upgrade by showing a popup with the following message: “Tips: Does mandatory format?” Confirm the upgrade by clicking on “Yes” on PhoenixCard’s popup window. This will trigger the kernel update process. "Searching update.sh from usb disk..."
"Searching update.sh from sd card..."
and verify that the date matches with the pcDuino3 Ubuntu rootfs release date. 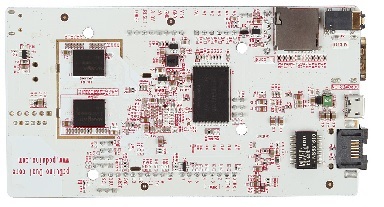 Congratulations, you have updated your pcDuino3! My upgrade was successful. Now you have to make a decision. Do you use the built-in NAND flash to run the OS or do you use a Micro SD card? That decision is yours! !